In a highly anticipated debut, Google has added a Pages feature to Google+ designed to connect people with businesses and brands. Google has also announced Direct Connect from Google search, which means that Google+ Pages will now be featured in search results to allow people to directly connect with the companies they seek. TheNextWeb.com reported on how Google hopes these introductions will give them a competitive advantage over Facebook by positioning them as a brand-focused connection for companies and consumers, as opposed to a Facebook-like forum for friends to interact with friends. 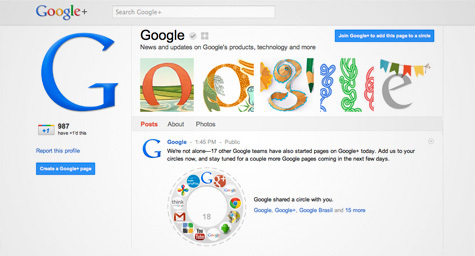 While Goggle+ Pages have a similar purpose as Facebook’s fan pages, Google+ Pages will be open to a larger variety of brands, businesses, organizations, and clubs. They will also require users to opt-in to become part of their “circles” and receive any communication. It’s also important to note that the Google +1 button will not automatically subscribe a visitor to a brand page. Instead, Google plans to introduce a new button that brands or publishers can use to allow people to join a circle in one simple click. Another difference from Facebook is that Google will not derive any direct ad revenue from Pages. Rather, they will be integrated into Google search, ad products, and analytics through the new Direct Connect feature. Google is hoping that these distinctions will attract the big brands, as well as small businesses that may or may not have websites to use Pages as their form of an online presence. “One of the opportunities Google+ Pages offers to marketers is another prominent home on the social Web,” said Kevin Barenblat, CEO of social marketing firm, ContextOptional, who believes that Pages will simply expand marketers’ options rather than replace other platforms. With the emergence of another social media platform comes the need to remind businesses and brands about the importance of having a comprehensive and customized social media strategy. There are many options for connecting with consumers, but finding the best digital strategy for your company comes down to expert advice and proper planning to ensure that your social media is a success. To discover the right social media moves for your company and your customers, contact MDG today.